One of the main reasons I started this blog was to educate people on how to make healthy lifestyle choices. One of the ways I do this is by spreading awareness about health issues that effect people every day. We are all familiar with the childhood obesity epidemic. Approximately one out of every five children in America is overweight or obese. Some people blame it on the fast food industry. Others say that kids are not getting enough exercise and are sitting in front of computers, televisions and video games too long. Still others say that the food that our kids eat at school is to blame. “I am too busy to cook healthy foods,” A lot of parents think that due to their busy lifestyle they must purchase fast food for their family. Dr. Pretlow points out in chapter one, “But would parents actually allow their kids to become obese with health risks, self-esteem problems, etc., just so the parents may save time?” Would you let that happen to your children, or would you do something about it? I have always believed that educating people on how to make healthier lifestyle changes will eventually put a dent into the obesity epidemic. But what lifestyle changes do people need to learn more about? The government bombards us with information on what foods we should eat and how often we should exercise. Based on the information provided by obese children in a poll conducted by Dr. Pretlow, kids today are not looking for that kind of information. They would rather learn more on how to resist cravings. Sixty-two percent of the kids polled stated that they learned about healthy eating in schools. Their lack of knowledge on healthy eating may not be a cause of the childhood obesity epidemic. Then, what is? If you want to know the truth behind childhood obesity you must go right to the source, the children suffering from it. As parents we want our kids to stay healthy and maintain a healthy weight. If your child is overweight or obese what can you do about it? In Chapter 5, Dr. Pretlow explains what obese children want their parents to do to help them. A lot of children don’t think that they can talk to their parents about their weight. They are lacking the support that they need from the most important people in their lives. If you have an obese teen please let him or her know that you are there for your child and he can talk to you about anything. Some of the kids on the website stated that their parents don’t provide healthy foods for them. A lot of the kids that used Dr. Pretlow’s website hid the site from their parents. These children have also stated that their parents are enabling them to become overweight by feeding them junk at an early age and not listening when when they’ve asked if they can join a gym or see a weight loss doctor or dietitian. Most of the kids involved also stated that their parents are also obese and are choosing not to attempt to lose weight, which is hurting their weight loss efforts. 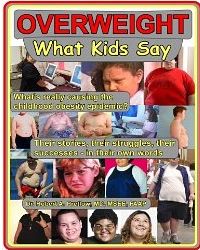 If you are concerned about the childhood obesity epidemic or you have a child who is overweight or obese you must read, “Overweight What Kids Say.” After reading this book you will see this issue from a whole new perspective. Dr. Pretlow’s research from his website is revolutionary and will open your eyes. Not only does this book present facts directly from the source, it also has solutions for families dealing with obesity. This is a must-read for all parents who would like some advice from a pediatrician who has been working closely with the children suffering from obesity for ten years. You can purchase Overweight: What Kids Say: What’s Really Causing the Childhood Obesity Epidemic for $11.10 on Amazon.com. It is also available in all major bookstores. *Disclosure: I received a copy of Overweight: What Kids Say: What’s Really Causing the Childhood Obesity Epidemic from Dr. Robert Pretlow in exchange for this review. All opinions are accurate and 100% mine. Totally agree on the nagging, doesn't get anywhere (with kids or husbands, I've learned!). Often does opposite! Good words on this post!! I have always thought that the parents had more of a say in the child's condition of obesity. It is because of my niece though not yet obese that I have realized that her mother's passive aggressive stance on her weight has it a greater issue in my niece's mind and she has no confidence. Good post. Thanks for your comments on my blog by the way. Education is the key. People need to understand the consequencies of the food they feed their children. It is possible to eat decently on a small budget and limited time..